The rear of the H Chassis looks like this. There are a total of 10 interconnect bays. The vertical bays (Bays 1- 6) are normally referred to as Standard Switch Modules and the horizontal ones (Bays 7-10) are referred to as High Speed Switch Modules. To utilise the horizontal bays, the Multi Switch Interconnect Module (MSIM) modules are required. What this does is it allows the vertical modules to be installed into bays 7-10. 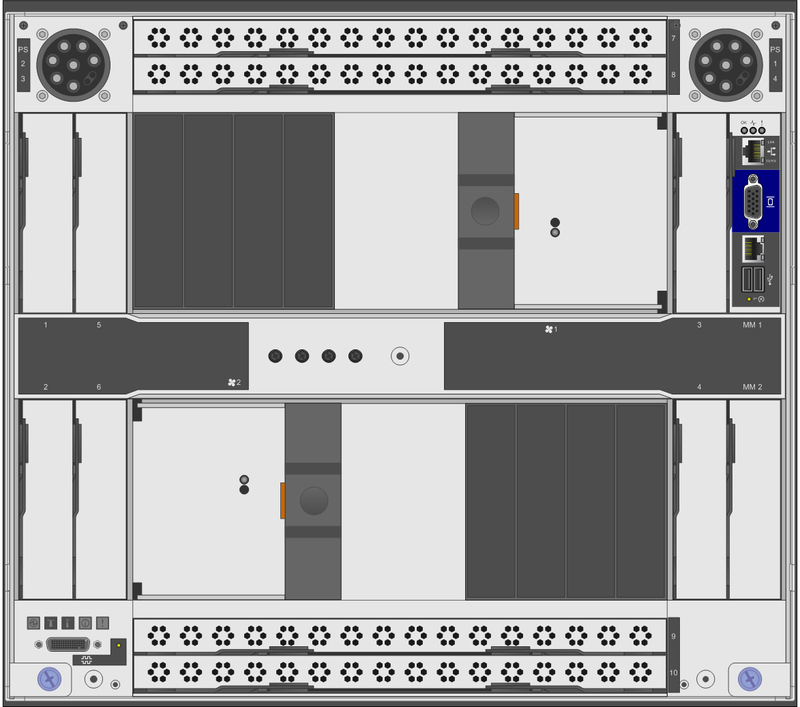 One MSIM modules occupies both bays 7 and 8, or both bays 9 and 10 simultaneously, allowing for two interconnect modules to be installed within a single MSIM module. The IBM HS22/HS22v server supports two processors, 12 DIMM slots (18 slots for HS22v), two SAS drive bays (two SSD for HS22v), has two onboard network adapters, an internal USB port (for ESXi) and two daughtercard ports – CIOv and CFFh. 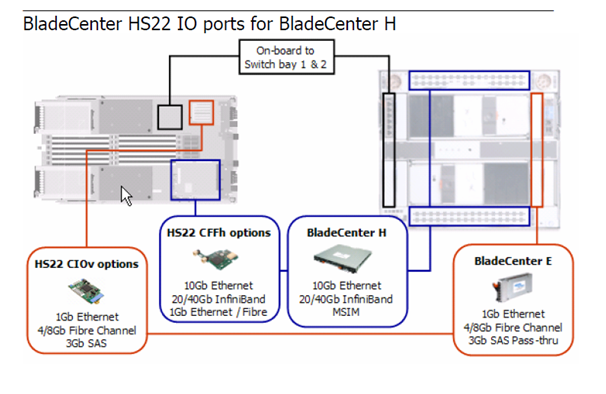 Similar to how HP C Class blades terminate the network and fiber ports, the HS22/HS22v also has terminations set via the BladeSystem back-plane and this results in a set configuration of the location of the interconnect modules in the rear of the blade chassis. The HS22/HS22v’s onboard network adapters, always terminate in bays 1 and 2 of the IBM BladeCenter H chassis. The CFFh card is different depending on the exact type of card that is selected. Any dual port CFFh port will terminate in bays 7 and 8, but any quad port CFFh card will terminate in bays 7, 8 and also 9 and 10. Of course as stated above, to utilise a CFFh daughtercard, the MSIM module will need to be installed first. One MSIM module in bays 7 and 8 for a dual port CFFh card and two MSIM in bays 7 and 8 and 9 and 10 for a quad port CFFh card. For this configuration though I will use the “Ethernet Expansion Card (CIOv) for IBM BladeCenter – CIOv” and the “QLogic Ethernet and 8Gb Fibre Chanel Exp Card (CFFh) for IBM BladeCenter – CFFh”. This allows us to meet our 6 NIC and 2 HBA requrements. The table below shows how the adapters within the HS22/HS22v terminate at the rear of the H Chassis. This diagram also shows how the adapters within the HS22/HS22v terminate at the rear of the H Chassis. So there you have it, the HS22/HS22v in a BladeSystem H simplified. Absolutely exactly the information I was looking for. Thanks! I had a quick hunt in the redbooks, but only found this information for the BladeCenter-S chassis. It depends which Bay that the particular blade that you are trying to configure is installed in. The 3110G normally has 14 ‘down’ ports and 4 ‘up’ ports so if you were configuring the blade in Bay 1 the corresponding port on the 3110G irrespective of the adapter will always go to gi0/1. The blade in Bay 2 will go to gi0/2 and so on…. Where did you find the chassis rear picture? Is there a front image as well? I can’t remember, if I can find it again, I’ll post. We have an E series chasis with the smaller expansion module on HS22 blades, I’m looking to further the expansion with the CFFH, can this be done? Can I have 2 on-board Ethernet, SAS Connectivity Card (CIOv) for IBM BladeCenter, and QLogic Ethernet and 8Gb Fibre Channel Expansion Card (CFFh) for IBM BladeCenter in a single blade HS22 on Blade Chassis H? we have bladecenter H in our environment, and 10G fabric switch module installed. would like to ask how is mapping of INT interface to EXT interface manipulated? in vSwitch perspective can we utilize INT interface as vNIC?